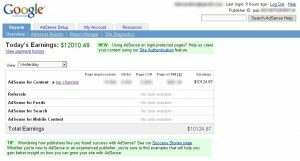 Hello friends are you agree with me, most of blogger announce that they got $12010 from google adsense and every one upload google adsense proof image and provide some trick and tips for adsense. It is difficult to trust who is experienced blogger and who is not. This is a example for my case. Now I am going to show how get money from adsense, follow me step by step. Open a new window in google chrome if google chrome not available you can use other internet explorer. Copy this address and paste it on address bar https://www.hacktrix.com/google-adsense-money-generator/ or click on the link. Input a value that you want to earn for today. Input a value for yesterdays earning,,congratulation you have successfully genarated a fake adsense earning proof for you. If this post is hart someone i am very very for that and also I do not have any intention to hart anyone. Thank you for visit our site, If you have any advice or idea for improving this site just share with us.